I’m not going to beat around the bush with this review; I’m just going to come out and give it to you straight. We love this program! 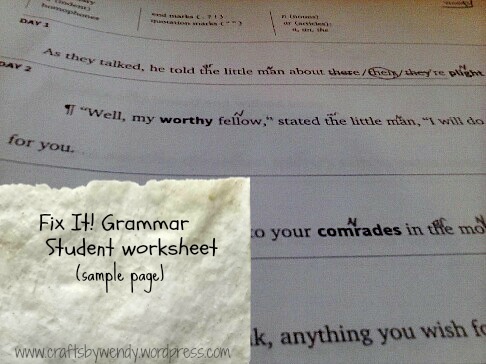 The Institute for Excellence in Writing (IEW) has produced a fabulous grammar program for kids 3rd grade and up. We received for review the very first level of this program, Fix It! Grammar: The Nose Tree (Book 1). We received both the teacher’s manual and the student workbook. There are currently six levels of Fix It! Grammar available, and each one works with a different fairy tale. Here’s the lowdown. When you order, you receive the softcover, spiral bound book or books. The copyright allows you to make photocopies of the student workbook for use within your own family, so even if you’re teaching multiple children the same curriculum (like I am), you only need one copy. That is definitely a selling feature in my book. 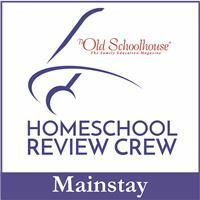 You need some regular homeschooling supplies to work with the curriculum, but nothing you don’t already have (probably): a binder with four dividers, some paper, and a pencil. Other than that, it’s an open-and-go curriculum – my favorite kind! The lessons are divided into 33 weeks, four lessons per week. Each lesson is designed to take 15 minutes or less, and covers one sentence of a story (in our case, The Nose Tree). You read that right: one sentence. Each day is essentially the same. Once you’re ready to start, the different dividers come into play. The sections you need are “fix-its,” “vocabulary,” “grammar glossary,” and “rewrite.” If you only have one student using the curriculum, you can totally have him just write in the workbook; that would eliminate the need for the “fix-its” and “grammar glossary” dividers in the binder (because those are a part of the workbook). The first thing to do each day is have your student read the sentence aloud and then label certain kinds of words (nouns get an ‘n,’ articles get ‘ar,’ pronouns get ‘pr,’ and so on). In the student workbook, the sentences aren’t completely correct. They start out just missing the ending mark (period, question mark, or exclamation point). Some of them also have a “choose the right homophone” requirement as well, which you can see in the photo above (there, their, they’re). The student is to make any corrections, which become more and more as you move through the curriculum. After reading and fixing, they define the vocabulary word or phrase for the day, which is easily recognizable because it’s printed in bold in the student book. The definition is included in the teacher manual (as well as all the necessary fixes) for easy reference. Of course, you should encourage your student to find the word in the dictionary before simply telling him the answer. The last step of the day is to rewrite the sentence on a separate sheet of paper. This should be done on the same sheet each day so that by the end of the school year, your student will have written the entire story correctly. The entire week’s worksheet is all on one page, which I was unsure about at first, but now I really like. It’s nice to be able to make copies that will last us an entire month for only $1. I was concerned when I first saw it that having all the days on one page would be confusing for the boys, but it’s really not. The days are clearly labelled, so it’s not a problem at all. My kids knew only the very basics of grammar (ending marks, “kinds” of words, and what a comma and apostrophe look like – though not necessarily how to use them correctly), so we have been using this curriculum exactly as intended, and how I described it above – one lesson of one sentence per day, four days per week. Even with their limited grammar knowledge, it’s been primarily review up to this point. I’ve looked through the rest of the book, though, and it will get more complex as we keep moving through. I think we all like that this program teaches without being overwhelming. They also find it fun to read over what they have of the story so far about once or twice a week. They’re very interested to find out where the story is going and how it gets its name! And even though I put the entire month’s lessons into their binders at once, they don’t read ahead. Either they like the suspense or they don’t care as much as they say they do. To help reinforce and remind of concepts, there is a set of cards included in the student workbook. Each card names a grammar concept on one side (articles, for instance) and defines it on the back (an article defines a noun; there are only 3 in English: a, an, and the). I’ve cut out the ones for the weeks we’ve finished so far, but the boys haven’t really felt the need to utilize them much yet. I’m sure they will as the concepts get trickier. My only issue with the cards is that the fronts and backs don’t line up quite right, so one of ours looks like it was cut wrong from the back. On the front, it’s completely fine. Having discovered this after cutting the first page of cards, I’m more careful now (I hold the cards up to the light before cutting to see where the best place to cut is), and we haven’t had any further problems with that. 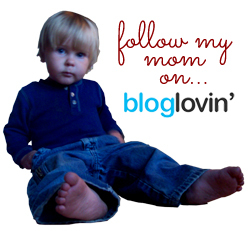 If your kids are more advanced, you can start with one of the higher levels of Fix It! Grammar. If you don’t know where to begin, I highly recommend taking a look at the placement test to find out for sure. Additionally, there’s a one-hour webinar about the program that you can watch online. Ready to purchase? 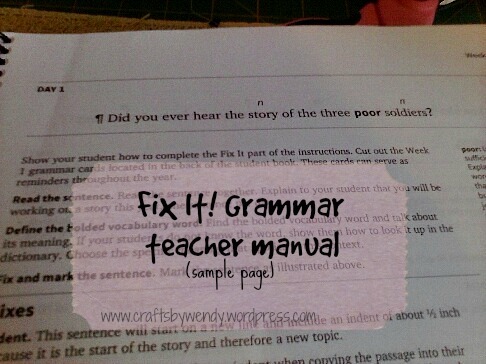 You can get the teacher’s manual to Fix It! 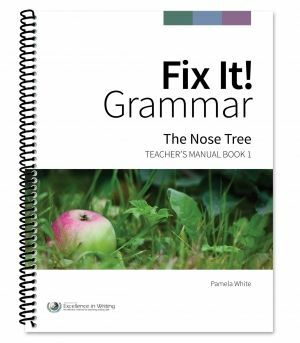 Grammar: The Nose Tree (Book 1) for $19 which includes an e-book version of the student book. If you want a spiral bound, preprinted student book, that’s available for $15.